Before your cat comes into pet accommodation, think about your daily interaction with your cat? Do you have quiet time to cuddle & relax? Do they enjoy lots of scratches & stroking? What about the playing chasey & going after that toy mouse? Our care program for your cat can include playtimes, cuddletimes and treats, which replicate the time that you spend with your cat. We have proven many times that one on one time spent with cats assists them to settle quickly and feel comfortable. A playtime is one on one time that your cat will spend with their carer doing what they like to do best. This can include lots of smooches & rubs, playing with our many toys which include; a feather on a stick, balls with a bell, toy mice and many more. There is a scratching post in our livingroom area that provides endless possibilites when it comes to playtimes; chasing a toy up and down, the toy appearing suddenly then hiding again, we hope you get the general idea!!! Playtimes are all about fun and the adventurous puss just loves these. 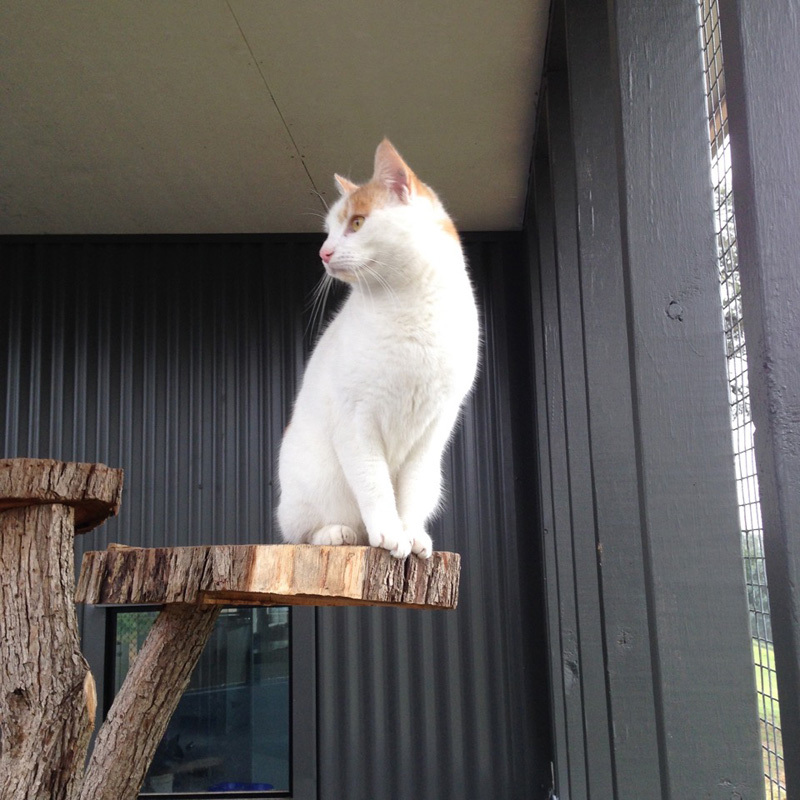 Our new outside play area is fun, exciting and designed for optimum enrichment for your cat. There are a series of walkways, ramps, platforms and bridges at various levels for cats to explore. They can choose to do as much or as little as they wish. We have toys to play with, beds in the sun and plenty of scratching opportunities. I cannot express the absolute delight we feel when we see cats enjoy this area - its awesome!!!! Some cats prefer a quieter holiday. A cuddle over the shoulder is popular with some, smooching and runs with others. A carer could also sit in a chair in our living room or the outside area and have puss delight with tummy rubs & stroking. Cuddle times are about lovely positive and caring one on one time to make your cat happy and purr. We have many treats on offer & this is really about what your cat likes to have. Some of the choices are be Greenies, liver, chicken wings/necks, tuna, chicken puffs or lamb puffs. We can either offer a variety or you can let us know what your cat would prefer.